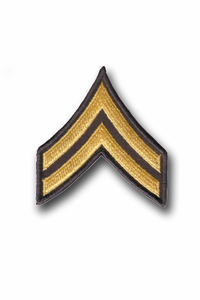 This Army Corporal Chevron Patch (Pair) is made by the company that supplies the United States armed forces. It is available in gold on green or gold on blue. Our military patches make an excellent addition to your collection or a great gift. It's quality is guaranteed! A percentage of the sale of each ArmyDecals item is forwarded to the licensing department of the U.S. Army in support of the MWR (Morale, Wellness, & Recreation) program. These payments are made by either ALL4U LLC or the wholesaler from where the item originated. Our team thanks you for your service and your support of these programs.